Siquijor is a small island in the Philippines; just south of Cebu in the Sulu Sea. And while it has the infrastructure to support tourism, it isn’t over-crowded like the towns of El Nido and Coron. 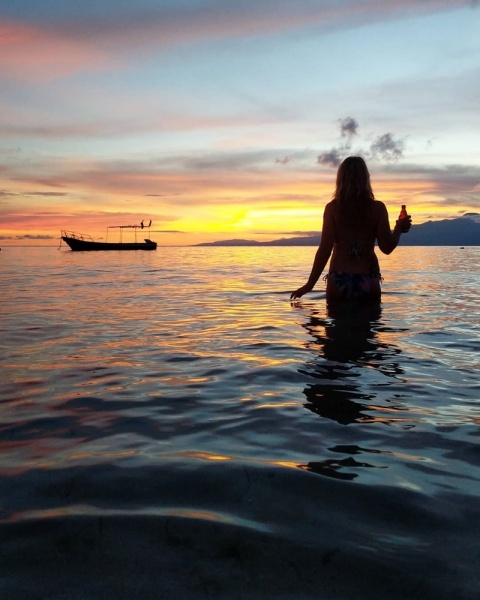 The vibe is laid back, the people are friendly, there are stunning beaches and waterfalls to explore, it’s an amazing place to spend a week or two relaxing! At the time of writing the conversion rate was 53.42 Philippine Pesos (PHP) to $1 USD. So if we say that something costs 250 PHP that’s just under $5 USD. Filipinos learn both English and Tagalog in school and you’re unlikely to encounter anyone who doesn’t speak English. If you want to try your hand at Tagalog, “salamat” is “thank you” and “po” is a polite ending to a sentence. So you would say “salamat po” or “nice to meet you po” or “excuse me po”. You’ll be referred to as “sir” or “ma’am” by pretty much everyone you meet. It’s a sign of respect and Filipinos are very polite. While the island is very safe, always take precautions. We had $40 stolen out of our luggage that was locked in our room at the Danish Lagoon. Opportunistic crime can happen everywhere so keep any valuables locked in your room safe. 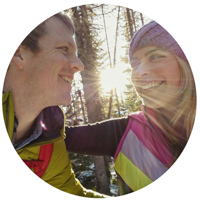 You are likely accustomed to enjoying four yearly seasons – summer, winter, spring, and fall. The Philippines only have two – wet and dry. Wet season lasts from June until October and dry season is November through May. If you visit during the wet season you can expect to experience the occasional daily torrential downpour but the waterfalls will be more spectacular! The temperature year-round is hot, but the hottest months of the year are April and May when temperatures average around 34 °C. Read all about what to pack for a vacation in the Philippines here! The Perfect Philippines Packing List! From Cebu Island you’ll need to catch a ferry to Dumaguete, change ports, and take another ferry to Siquijor. It takes 20-30 minutes to get from Tandayag Wharf to the Dumaguete City port and a tricycle is the easiest option to get you there. When you arrive to Siquijor Island there will be plenty of tricycles waiting to take you to your hotel. And many of them also offer reasonably priced motorbike rentals (300 PHP/day). They can drop the motorbike off at your hotel and then pick it back up when you are done with it. They can even bring more than one option if you want to have options. There is one main road that circles the island and traffic is minimal. If you’d rather not rent a motorbike, there are plenty of tricycles that you can flag at any point throughout the day. After 9:00pm they generally congregate around the popular bars and the price doubles. 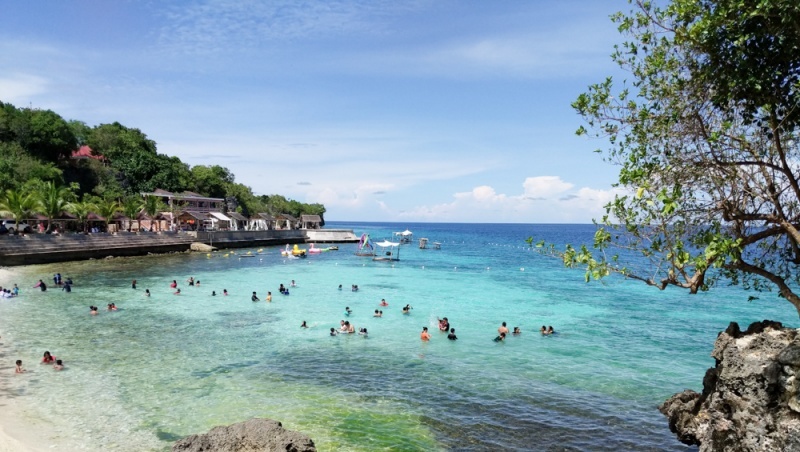 While island hopping is not as popular on Siquijor as many other destinations in the Philippines, most hotels can help you arrange a boat trip to nearby Apo Island to go snorkeling (or diving) with sea turtles. If you plan on diving don’t forget to pack your scuba diving gear! The most popular tourist area of Siquijor is in San Juan. Most of our restaurant and bar recommendations are in this area as well. Coco Grove Beach Resort is the premiere place to stay on Siquijor Island. With spacious rooms, a stunningly beautiful pool, a pristine beach just steps away, and plenty of restaurant and bar options, everything you need is right at your fingertips! 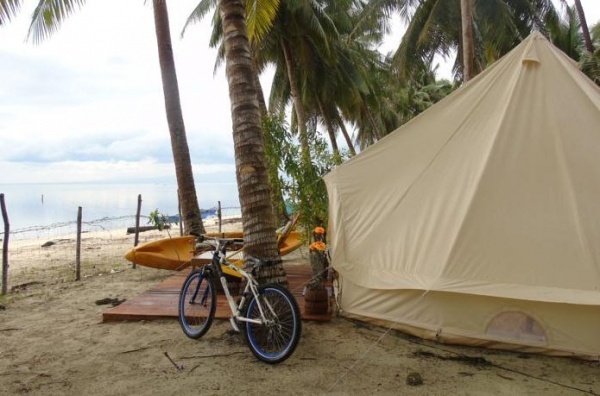 For a truly fun and unique experience, you’ve got to try Glamping Siquijor by the Beach! These luxury tents are equipped with a large bed, a fan to keep you cool in the evenings, shared bathrooms, and are ideally situated right on the sea. Lounge on your personal hammock in the afternoons and join the other guest for the nightly bonfire! Salagdoong Beach is the most popular beach on Siquijor Island for locals and foreigners alike. There are a range of activities available for the whole family which makes it a fun way to spend an afternoon. A small island sits right offshore with two diving boards of differing heights and a water slide (although they close depending on the tide). 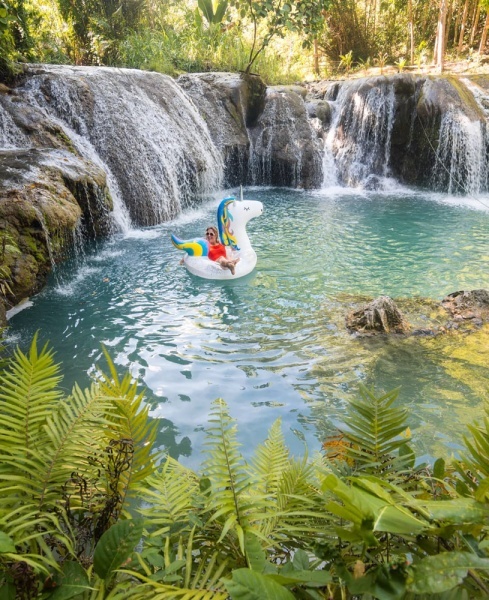 The nearby resort rents out fun floaties and floating swings, creating the perfect setting for an Instagram photoshoot. There is also a restaurant onsite if you get hungry, or better yet, bring your own picnic and rent out one of the covered tables for the afternoon. The beach is small and virtually disappears at high tide but the water is crystal clear and perfect for soaking or snorkeling – don’t forget to bring your snorkeling mask and snorkel! 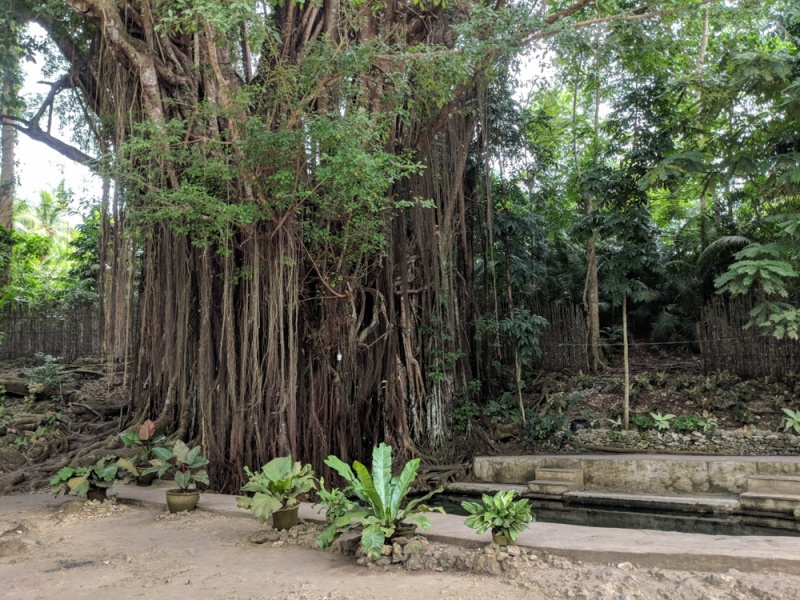 On your way back to San Juan it’s worth a stop at the Century Old Balete Tree for a foot spa in the shadow of this beautiful ancient tree. You’ll also find various love potions and other voodoo-style souvenirs being sold here as the locals believe this tree has mystical powers! The Philippines is a country known for pristine beaches and dramatic waterfalls and you’ll find a little of both on Siquijor Island. 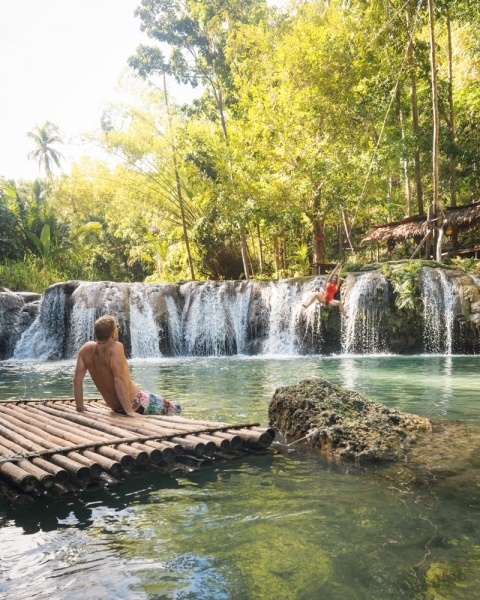 Cambugahay Falls is by far the most popular swimming hole on the island, with locals and foreigners alike. There are two small waterfalls with large swimming holes at the base of each. There are also several rope swings at each and for 50 PHP/person you can use them as many times as you please. There are also small shops selling snacks, cold beverages, and ice candy (a must-try sweet treat!). Lugnason Falls is not as popular but serves up its own share of adventure. It’s just a short walk down to the falls but you’ll likely have a local want to guide you there for a tip.The waterfall is pretty and there’s a deep swimming hole at the bottom. A guide can help you know the best place to cliff jump and can help you try the very high rope swing. If you have extra time explore the 11 smaller waterfalls up river that are all named after Zodiac signs (Lugnason Falls is also know as Aquarius Falls). The other waterfalls aren’t as large or picturesque as Lugnason Falls but the walk along the river is scenic. Luca Loko serves up the best breakfast on the island! 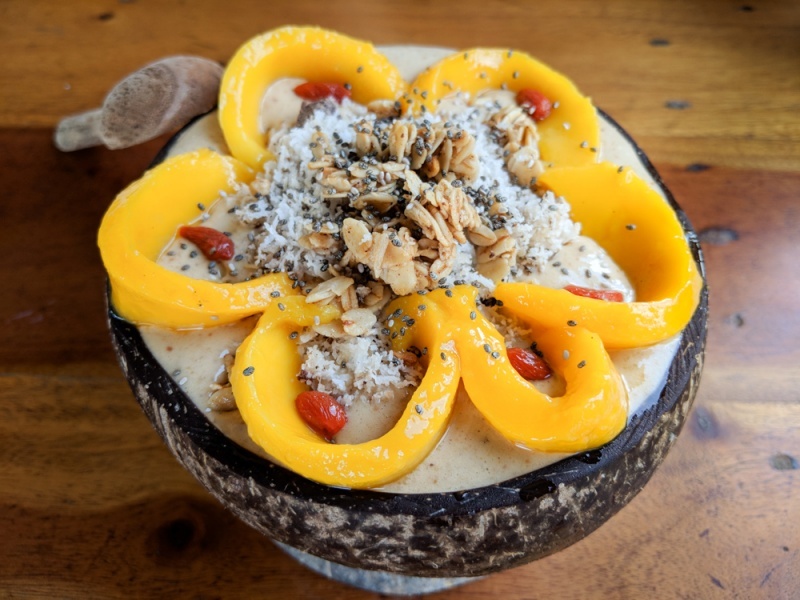 Large smoothie bowls made of fresh mango or peanut butter and banana is the perfect, healthy way to start your day. Marco Polo offers cute covered tables right on the beach. Their pizza is known for being the best on the island. They often offer food and drink combos that are a great value. Fuego Cantina & Grill has a nice open-air restaurant, delicious Filipino food, and a super friendly staff. 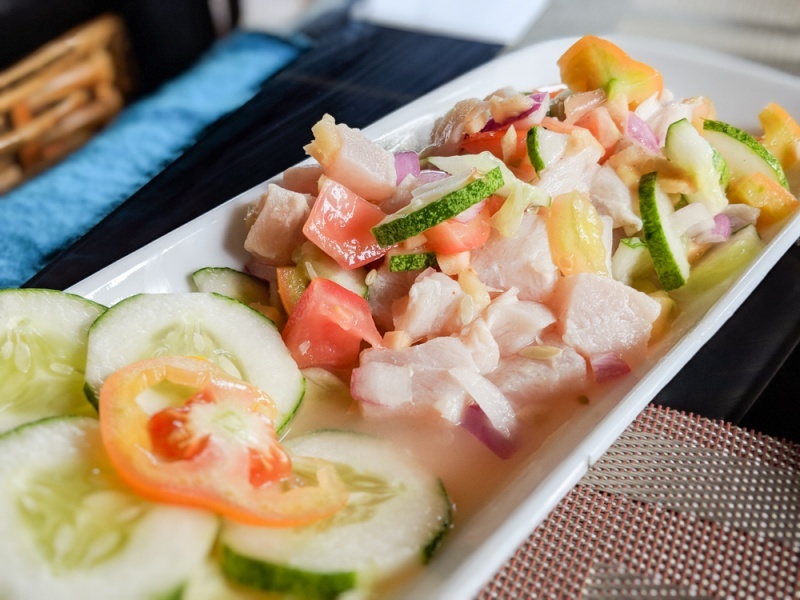 If you like ceviche, you’ll love their kinilaw – the seafood is super fresh and it’s a good portion. Baha Ba’r is not only a delicious restaurant, it also has a great late night vibe! Be sure to start your meal with the chicken wings, they are scrumptious. They occasionally offer a buffet with perfectly seasoned pork and plenty of other options as well, it’s a good deal for the price. Many of the restaurants and resorts are situated right on the beach and offer spectacular views of the sea. Plus most of the beaches on Siquijor Island are private property so unfortunately you can’t just grab a beer at the market and post up on the sand. 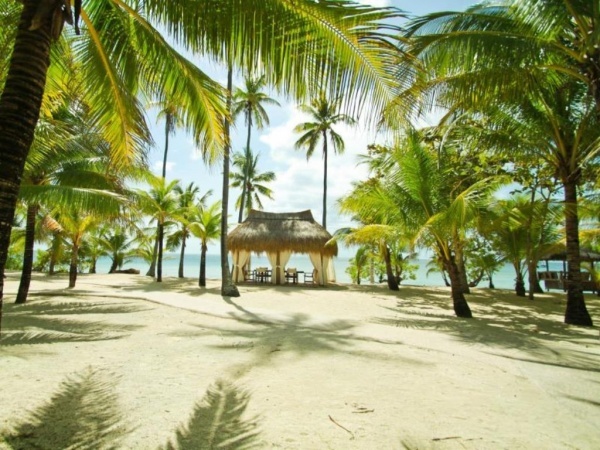 Sunset Restaurant is part of the Coco Grove Beach Resort and is situated right on Tubod Beach. The drinks are reasonably priced and the views of the sea at sunset are unreal! Grab a cocktail and a table and enjoy the unobstructed views. This small stretch of beach is actually public so if you’d rather not sit at the bar, just take the beach access road next to the resort. 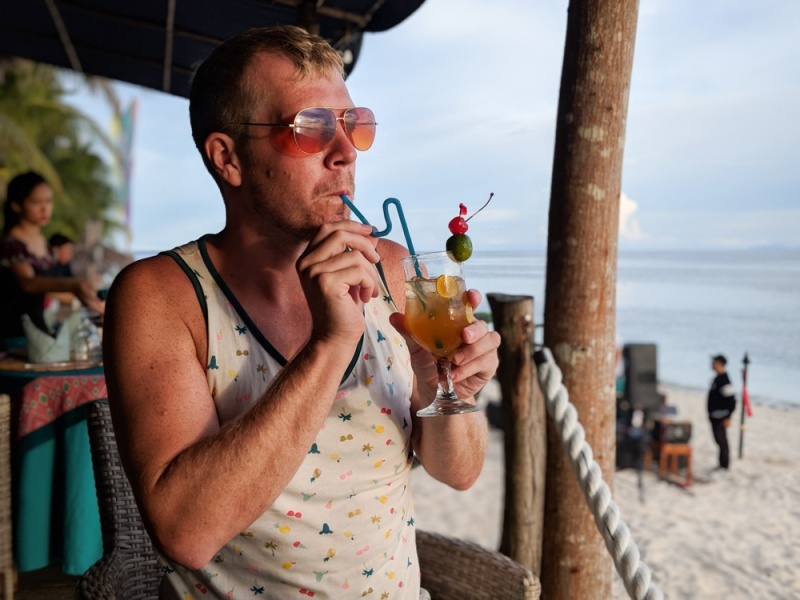 The San Juan area of Siquijor Island is filled with bars touting happy hour drink specials and live music. You can find something to do any night of the week but the locals really turn it up on Friday nights. That’s when they all head to Czar’s Place. The front of this budget hostel becomes an open air concert hall on Fridays with a stage, heart-pumping live music, and a huge dance floor. It gets packed so get there early if you want to lock down a table. If you’re looking for more of a chill evening vibe, Monkey Business also has nightly music but lower key. Comfortable seating areas and even swings make this an enjoyable spot to have a few beers and make some new friends. Did we miss anything? Add your favorite Siquijor adventures in the comments below. Want more info? Check out our favorite travel guides and books about the Philippines!